There is no group of people I love more than my local church. I love everything about my church, the good and the bad. I love the good because it encourages me in my Christian life. I love the bad because it reminds me of how much I need Christ and those around me also need more of Christ. The church continues in sanctification until the Lord’s return. Not a day will go by where those in the church will not need more grace in this life. Since I love the church, I love institutions that support and help the church. 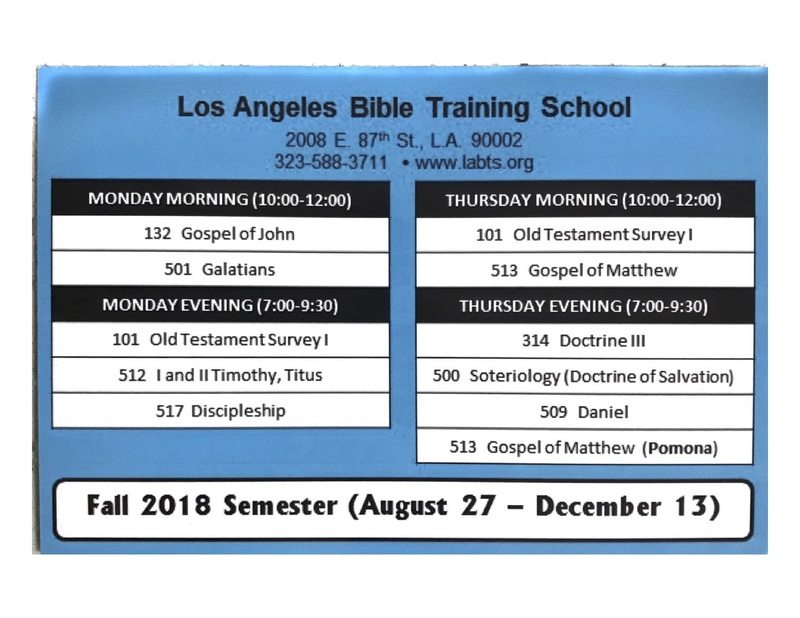 In my opinion, one of the greatest treasures of churches in the Los Angeles area is The Los Angeles Bible Training School. It has been known as “the best kept secret in LA.” Top notch scholars have taught there and even endorse this tiny Bible school. It is Biblically Sound. The school is faithful to biblical Christianity. The school is committed to the inerrancy of Scripture. It is faithful to the historic Christian faith and you are guaranteed to receive a solid Bible education. On top of that, many of the professors teach at respected evangelical institutions such as Biola and The Master’s College and Seminary. This shows you that you are receiving a serious Bible education. It is For the Christian (Not the Pastor). The school is intended to help laymen learn the Bible. Think of it as a junior college setting for Bible school. We often think that Bible schools are just for pastors and missionaries. LABTS is for all Christians who simply want to study the Bible. It may not have huge university lecture halls, but it’s a place that people on varying levels of spiritual maturity can attend and be edified. It has Other Committed Christians. In our world, it feels like Bible believing Christians are an endangered species. Coming to a place like LABTS shows you that God is working all throughout the LA area in places and among people you have never heard of or met. You will be encouraged by the like-minded people you will meet. It is Affordable. The school itself is extremely affordable. It cost $75 per semester (not per class). This means that you can take up to four classes for the price of $75. There really is no excuse not to be able to attend a solid Bible institute for this price. It will Challenge You. Yes, you will be challenged and that’s good for you. Everything about it may challenge you. There may be times when the people will challenge you, the professors will change you, the chapels will challenge you, and even the traffic to get there will challenge you. The reason why this is important is because we can easily become spiritually stagnant. A little challenge may be what you need to kindle afresh your love for God! Hello Theresa, you can visit https://www.labts.org/ and they should be posting the upcoming classes for next semester. Thank you!